Nothing reminds me more of summer than a freshly baked Blueberry Pie full of big and plump, sweet and juicy berries. The important thing to remember when making a fruit pie is to start with good quality blueberries. If using cultivated blueberries make sure they are firm, plump, fragrant, and dark blue with a dusty white bloom. The white bloom is the blueberry's natural protection against the sun and is a sign of freshness. It is also important to pick through the blueberries and discard any soft, moldy, or crushed ones. Because blueberries have such a wonderful flavor all this pie filling needs, besides the berries, is a little cornstarch (corn flour) to thicken its juices and a little sugar, lemon juice and lemon zest. Of course, all fruit pies need a crust and, for me, nothing beats this delicious Pate Brisee (short crust pastry), which has a wonderful buttery flavor and crumbly texture. You will notice from the picture that while this pie has a top crust it is in the form of pastry stars. 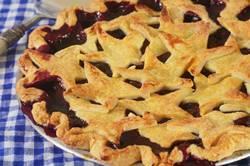 I know that this step is a little more time consuming but it does make for a very festive pie, especially at your next 4th of July celebration. (This innovative idea comes from Martha Stewart excellent new book called 'Martha's Stewart's Baking Handbook'.) Lastly, when you pull the baked pie out of the oven there is the temptation to cut into it right away. Resist if you can. Fruit pies need several hours to set so that when you finally cut into them the fruit is juicy but these juices will not run. Excellent plain but even better with whipped cream or vanilla ice cream. Pie Crust: In a food processor, place the flour, salt, and sugar and process until combined. Add the butter and process until the mixture resembles coarse meal (about 15 seconds). Pour 1/4 cup (60 ml) water in a slow, steady stream, through the feed tube until the dough just holds together when pinched. If necessary, add more water. Do not process more than 30 seconds. Preheat the oven to 400 degrees F (205 degrees C) and place the oven rack in the lower third of the oven. Remove the chilled pie from the fridge and place on a larger baking pan, lined with parchment paper, to catch any spills. Bake the pie for about 20 minutes and then reduce the oven temperature to 350 degrees F (177 degrees C). Continue to bake the pie for about 35-45 minutes or until the crust is a deep golden brown color and the juices are bubbling and thick. If the edges of the pie are browning too much during baking, cover with a foil ring. Editors of Saveur Magazine. 'Saveur Cooks Authentic American'. Chronicle Books. San Francisco: 1998.